Thanks for another comment. 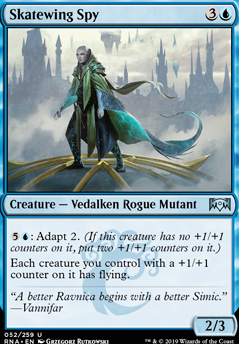 I do like your idea of adding in some "+1/+1 counter lords" and I already have some in the form of Skatewing Spy , Zegana, Utopian Speaker and Herald of Secret Streams . I have considered the ones that you talked about before. I'll playtest once I get a chance, but for now, they'll be in the maybeboard. Thanks for your suggestions and upvote. I think I agree with you on adding some more mana ramp. My deck is pretty slow, and getting that creature out one turn earlier may help with that. I am going to add a Talisman that you suggested and an Incubation Druid and take out the Hideaway lands. I found that I couldn't activate them as much as I wanted and that they slowed down my game occasionally. Thanks for your suggestions. I'm not a big fan of Mycoloth as it might be a bit too slow and my deck doesn't have many things it can sacrifice. 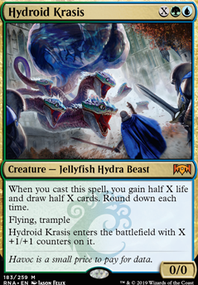 I'm not a big fan of the Hydras again because they're a bit too slow. 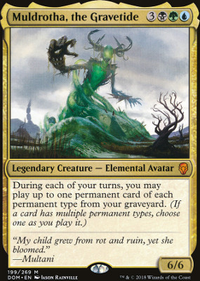 I am a fan of Incubation Druid , that that will take up a ramp slot that was provided with the cutting of two lands. 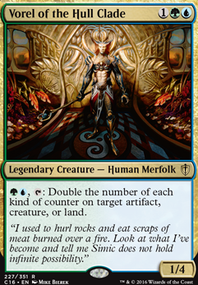 The Mending of Dominaria seemed good at first, but I just didn't have anything to do with it, so I think I'll cut it for Skatewing Spy . While I can't disagree that Rhystic Study is a bad card, I think that Bred for the Hunt is better for a +1/+1 counter deck. I'll playtest it and see how it goes and keep you updated. Bigant1 on Welcome to the Strange Land of Dice! Primordial Hydra , Kalonian Hydra , Avatar of the Resolute and Mycoloth , Incubation Druid , and Skatewing Spy all seem like good cards for this deck. Rhystic Study is also a good card draw enchantment. Thanks for all the sideboard suggestions. For now, the deck will only exist on Arena, and I'd like to use it in the new BO3 format. I definitely need some protection against flying in the sideboard. Definitely Arbor Armament and Skatewing Spy . I wonder if it's worth mainboarding the red aggro hate cards, since it's so dominant in the arena meta that I'd likely lose half of my game 1s in BO3 without them. Also thinking it's probably worth sideboarding-- or even mainboarding-- counterspells and/or enchantment removal. Ravnica Allegiance is stocked with great enchantments, and so that could help me disrupt the slower decks in the meta, especially the Wilderness Reclamation gate stuff, which I see a lot of. And for the same reasons a lot of people are mainboarding enchantment removal (I see a lot of Mortify ), so Negate could be a big help. All that said, I haven't been able to do any testing, since I'm still building up the wildcards to actually put the deck together. As cheesecake mentioned the familiar with the growth chamber guardian is bonkers. After looking at both of your brews I took a copy of mine and made a more aggro version and those two go together hand in hand. During testing I am seeing 2-3 4/4 GCG on board really early game. T1 lawnmower elf, T2 growth spiral into a off land biomancer familiar, turn three you can have just about 5 cmc card down or you can play a GCG adapt him for one G pull another and drop him on the board too. Turn four is adapt the fresh one tap the familiar to re adapt the first one and refill your hand with the last GCGs. SO now on turn five your opponent is looking at a 1/1 2/2 6/6 4/4 and knows you have two more elf crabs in your hand to pump up for cheap. I have also had an incubation druid get seriously out of control with the familiar. My brew uses the Enter the Unknown over stony strength as If it misses and hits a land I still get to flop it on down. If it hits and I have a land in hand, its a a counter and I get to flop another land down. Several games goldfishing I have had five lands down on turn three plus a llanowar and druid. That is a buttload of usable mana on turn four. Now with red burn in the format as strong as it is I need to find a way yo stay alive for a while longer. I guess krasis is my best option. Still working on the aggro version. Ill put it up when I feel it is refined. I think Goblin Cratermaker would be a good choice in a more budget list. I have been keeping an eye on RNA. So far nothing has really struck me as a very significant improvement though. 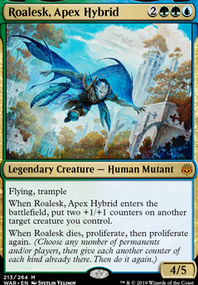 Essence Capture is a bit restrictive and honestly creatures aren't really an issue most of the time, so if anything 'non-creature' is what I'd rather see. 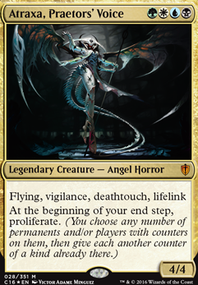 I'm already running around 10 flying creatures at the moment, so I don't think there's a great need for Skatewing Spy , and like you said, it's basically Herald of Secret Streams otherwise. I actually do like Priest of Forgotten Gods , but I think having to sacrifice 2 other creatures is a bit demanding here and i feel that it's going to just be too many hoops to jump through most times. this is another card I'd probably play in a budget list but not otherwise. Bedevil is basically a straight upgrade to Dreadbore but I'm not absolutely certain that I'm happy with the colored mana cost increases. It is a card I would want to test for a while and since it's like $7 I probably won't get around to testing it in the immediate future. I would say feel free to try it though since it doesn't seem too difficult to cast where it's only an extra which is our main color.